Climate change and national security: Pentagon warning and vast new Russia Arctic claim. In Putin’s Russia, icebreaker breaks YOU. 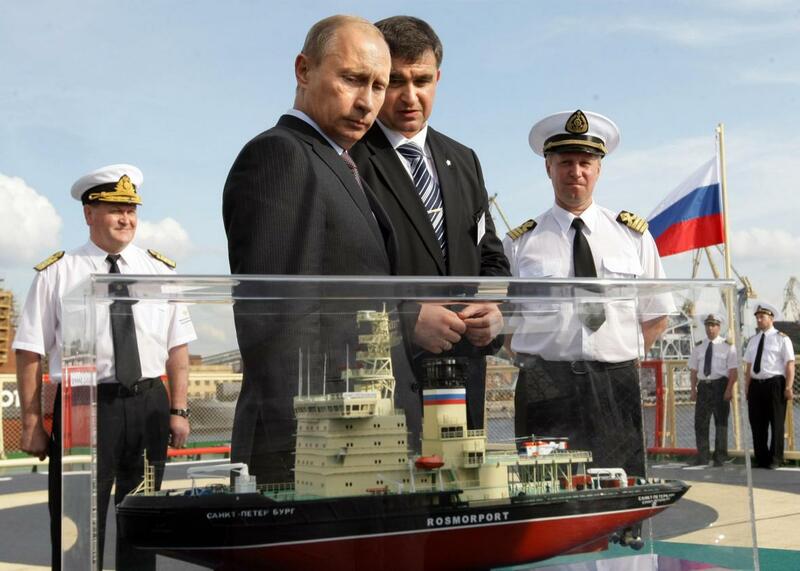 Here, then–Russian Prime Minister, current President Vladimir Putin is seen during his visit to the new icebreaker St. Petersburg on July 12, 2009. Global warming could turn the Arctic into a 21st-century battlefield, and the United States isn’t prepared. That’s the key takeaway from a new Pentagon report on the national security risks of climate change that, for the first time, looks region by region around the world from the standpoint of military commanders. Global climate change will have wide-ranging implications for U.S. national security interests over the foreseeable future because it will aggravate existing problems—such as poverty, social tensions, environmental degradation, ineffectual leadership, and weak political institutions—that threaten domestic stability in a number of countries. Though the report mentions recent climate change–related pressures like drought in Syria, flooding in Pakistan, sea level rise in the Pacific, and extreme weather events in the United States, the most chilling sections are those that discuss the growing security risks in the still-frozen north. Just days after the Pentagon’s latest warning, a bold territorial claim by Russia on Tuesday—including to mineral rights in a region of the Arctic larger than France and Germany combined that includes the North Pole—emphasizes that the real-world implications of melting sea ice are rushing to a head much sooner than expected. As the New York Times noted, such claims are a new phenomenon being driven by the ability of countries to drill for oil farther north because of melting ice caused by global warming. In recent years, temperatures in the Arctic have increased at twice the rate of the global average. As Vladimir Chuprov of Greenpeace said in a statement, “the melting of the Arctic ice is uncovering a new and vulnerable sea, but countries like Russia and Norway want to turn it into the next Saudi Arabia.” If Chuprov’s prediction comes true, the Arctic could become one of the most important regions of geopolitical instability. Russia’s claim, if approved by the United Nations, would have lasting impacts for the planetary ecosystem as well. After a similar claim in 2001 was denied, a Russian mini-sub was dispatched to the North Pole sea floor where it planted a flag. The new Russian claim includes an estimated 594 oil fields, 159 gas fields, and more than 350 gold deposits. A recent scientific study said that any amount of drilling for oil in the Arctic is inconsistent with global goals to limit climate change, not to mention the unique environmental risks that accompany the short Arctic drilling season. Should a spill or accident happen toward the end of the summer, it may take months until ice retreats enough to remediate it in the following summer. The U.S., Canada, Norway, and Denmark have all tried to assert territorial influence in the Arctic in recent years, and Denmark’s previous claim is in direct conflict with Russia’s new claim. This is what the “threat multiplier” effect of climate change that the Pentagon report describes looks like. Climate change is “a present security threat, not strictly a long-term risk,” according to the Defense Department. That case only seems bolstered by Russia’s latest maneuvers. The emerging Arctic dispute shows that climate change won’t just disrupt places already in conflict, though those places will be hit hard as well. To help defend its territorial claims, Russia has 37 icebreakers—far more than any other Arctic nation. Fourteen more are currently under construction. Meanwhile, as Russia works to bolster its already-significant military presence in the Arctic, you can count the U.S. fleet of icebreakers on one hand: There are only two, and right now, just one is working. The Coast Guard is in the initial stages of building more, but that will take time and a lot of money. Still, even President Obama, who has called the politicians who deny human influence on climate change a threat to national security, is in favor of expansion of Arctic drilling. Opponents of this decision last week briefly blockaded a Shell icebreaker from leaving its Portland, Oregon port. Obama is expected to become the first sitting president to visit the Alaskan Arctic later this month, on a tour to promote his recently announced climate change plan.